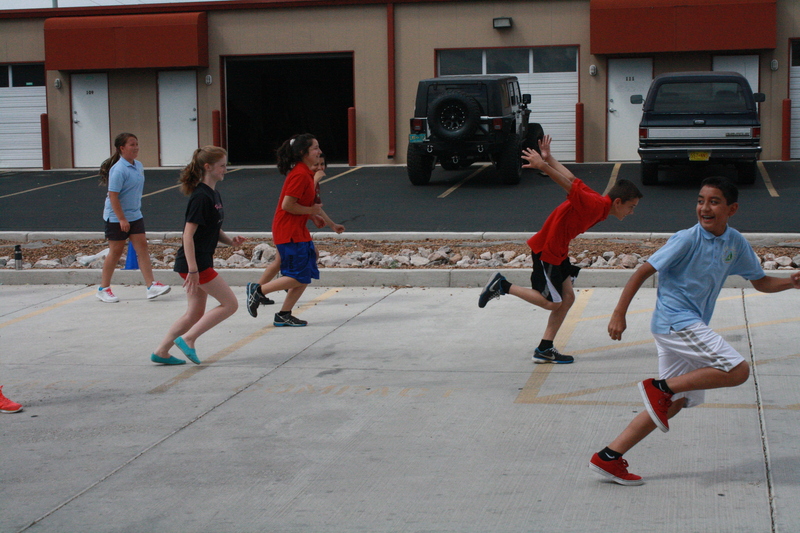 Middle school scholars practice drills during sixth period P.E. class. — A daily P.E. course has been added to the ASK Academy curriculum. Middle school scholars will take P.E. during sixth period; high school scholars during fifth. Project Manager Darla Fields is heading up the two courses. She holds P.E. class in either an upstairs room, or in the school parking lot. The state of New Mexico requires high school graduates to have at least one credit in Physical Education. By adding this class to the schedule, scholars can earn that credit during the school year, as opposed to doing it during the summer, as had been previously offered by ASK. The first five minutes of P.E. class is spent changing into gym clothes, which actually factors into the grade, Fields said. The class has a dress code of workout clothes and appropriate shoes, which if not followed, can bring down a scholar’s grade. Unlike other public schools, there are no locker rooms or showers after the class, so scholars have to make due. “They have five minutes to get dressed, or they wear their gym clothes under their school clothes,” Fields said. Since the school has no gym, Fields has learned to work with the environment she has been given. “You learn to creatively modify,” she said. “The parking lot is our gym.” Fields hopes in the future the Academy will get acquire a gymnasium. In order to receive a passing a grade in the class, scholars must first be willing to participate. “There is a lot of team work involved, picking your team wisely, and working together well with that team,” Fields said. Right now, the class is conducting skills testing, which means the number of push-ups, pull-ups, sit-ups, and leg lifts are recorded. Scholars are being timed on how long it takes to run both a mile and short distances; and flexibility, height and weight measurements are taken. Scholar Raleigh Sikes said that the new class is enjoyable, and it’s a fairly easy course, since there is no work to be done on paper. I wish I had PE!